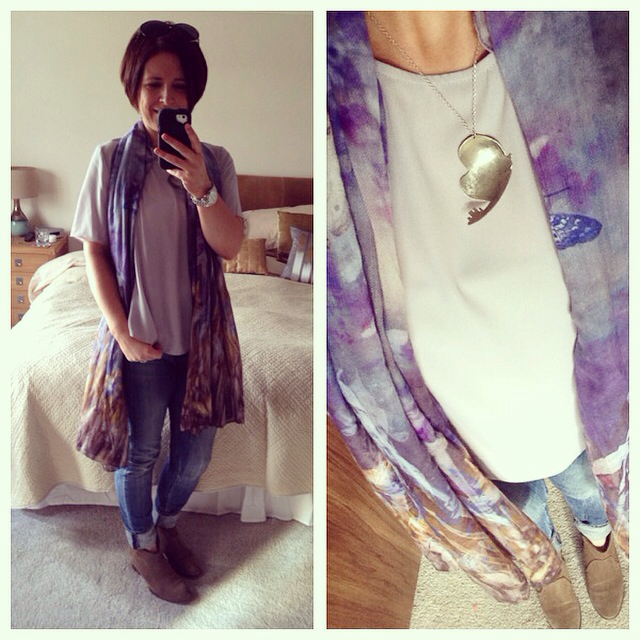 Today was the first day I turned up the jeans and got the ankles (almost) and arms out! It was a gorgeous day with sun streaming in the windows and my kitchen worktops were fitted! So so pleased with them and I promise I'll share before/during/after photos once we've unpacked boxes, cleared out all the tools and had the room painted. The top I'm wearing is a bit of a find from Tesco the other evening. It's a very simple floaty t-shirt style top with a longer back and split/pleated sides in a neutral shade of grey/blue. I also picked up the same top in black. They're down to £8 in the sale - a great wardrobe staple. I bought 12's in both and they're on the large side. 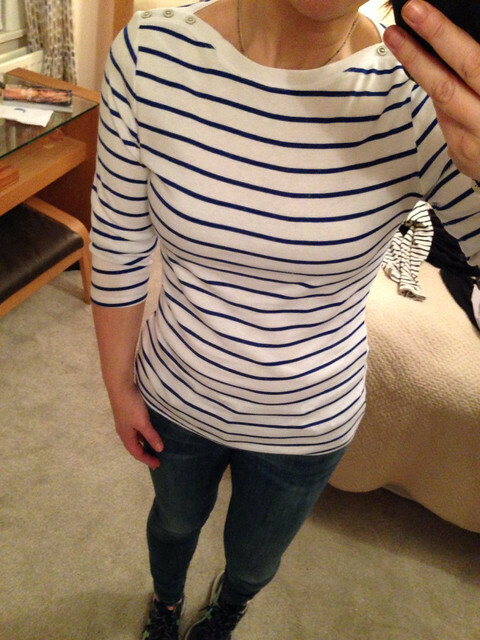 And if you're looking an inexpensive breton, this one caught my eye in Tesco also. Just £7 with a boat neckline though I had to size up to a 14 so they're not generous. Not online yet but there were loads in Newtownbreda. The blue is brighter than the pictures - more of a royal blue rather than a navy. And the hair has gone shorter - took the head staggers at the news that Johnny would be out of the country for 7 weeks so I asked for an 'Emma Willis' inspired short cut. 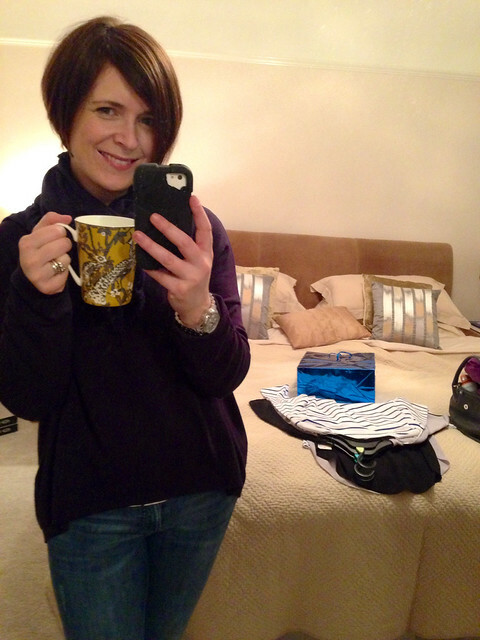 Really pleased with it - here's a close up of it (and my new mugs - a clue to my kitchen colour scheme!) ahead of my trying on session. Hope you've had a good week, especially those of you still on half term - my lot went back on Wednesday thankfully. It's been so tricky managing school holidays and renovations! Your hair looks fab, I'm feeling so ready for a colour change with spring arriving! Love the hair! Tesco has turned up a few gems for me lately too, not something I thought I'd ever hear myself saying, but it does soften the blow a little when you can incorporate your purchases into the weekly shop! Hair looks amazing Avril. That breton is a steal! All the crocuses are out now but today has been atrocious with heavy rain and a howling gale. really love the new hair, and a new Breton is ALWAYS acceptable! The hair is beautiful! Johnny did good!